When I think of Mediterranean inspired appetizers, the first thing that comes to mind is hummus. It's a great dip to serve with crudites, pitas or even toasted baguette slices. I knew I had to include some kind of hummus in the Mediterranean menu I was putting together for friends. Rather than making a simple, classic hummus, I thought of other flavors to make... like Spinach & Artichoke Hummus! One popular dip I enjoy is Spinach & Artichoke. 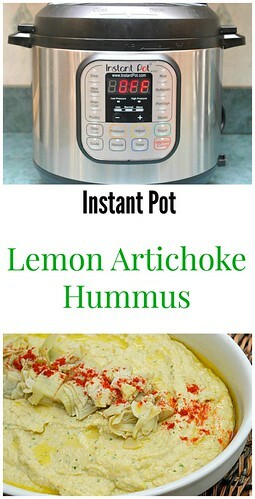 It's a great flavor combination and with hummus as a base recipe, it's a flavor that can be incorporated well. I did a search and found the following Rachel Ray recipe and made a few adaptations so I can prepare it in the Instant Pot. I really liked how the recipe came out because it still maintained a hummus quality and had a great balance of spinach/artichoke flavor without it being too overpowering. To serve, I provided a few dippers including baby carrots, cucumber slices, whole wheat pita triangles and toasted baguette slices. Press BEANS/CHILI on the IP. Add the dried chickpeas and water into the IP. Press MANUAL and adjust the time to 40 minutes on HIGH pressure. Once at pressure, the display will reflect 40 (the number of minutes you initially set) and will begin to countdown to 0 minutes. When the IP beeps after pressure cooking for 40 minutes, allow your IP to naturally release pressure completely. While naturally releasing pressure (also known as NPR or NR), the display will reflect numbers counting up from 1. The numbers indicate how many minutes the IP has stopped cooking since it beeped (or how many minutes it has been naturally releasing pressure). No need to touch your IP while it naturally releases pressure. Allow time (mine took about 50 minutes) for this to complete. The pin at the top of your IP will drop when all pressure has been released and it's safe to open. Remove the chickpeas from the IP and drain. Transfer chickpeas to the bowl of a food processor. In the food processor with the chickpeas, add the remaining ingredients except the sun dried tomatoes and puree/process until smooth. Fold in chopped sun dried tomatoes and transfer into serving bowl.